Hot on the tail of doing some excellent business for Damarai Gray (who will join a packed attacking line-up), Leicester are looking to further cement their impressive season by bringing in some more mettle to their midfield. 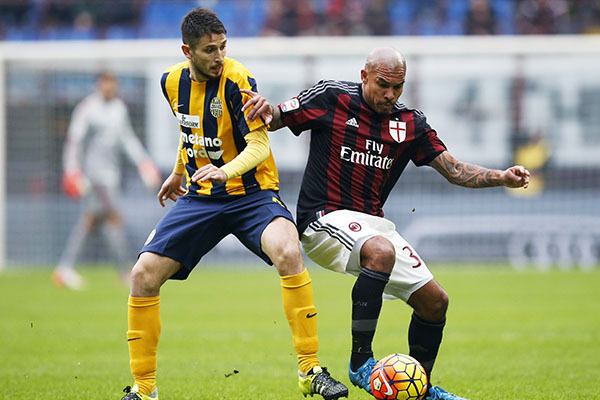 Having lost the invaluable experience of Esteban Cambiasso in the summer (and suffered not a single hangover from it), the Foxes are looking to bring in similar experience in the shape of AC Milan's controversial Dutchman Nigel De Jong. According to the Mirror, Claudio Ranieri is offering Milan £2m for the 31-year-old as a replacement for Gokhan Inler, who has seen his chances at Leicester dramatically reduced. Which would have sounded like the ravings of a wildman last season, but here we are. The Swiss midfielder is also being linked with Schalke, and the Mirror say De Jong has been identified as the key replacement. To sweeten the deal - and as a mark of their confidence - the English side are also offering a £1m kicker if they qualify for the Champions League. The fact that that isn't out of the question is an indication of how far they've come this year. As a Newcastle fan, it's hard not to offer a word of warning. When the Magpies infamously threw away their lead at the top of the Premier League in the mid 90s they did so partly because of some mid-season transfer business. While Tino Asprilla is often touted as the problem, it was in fact the purchase of tough-tackling David Batty that upset the balance of the team, as Kevin Keegan sought more grit in midfield to the detriment of the players he already had. Let's hope Ranieri has thought this one through a little better, because football clubs are always damned to repeat history. Would you be happy if Leicester signed Nigel de Jong in January? Sound off below.